Purpose: Objective documentation of airflow obstruction is often lacking inhospitalized patients treated for acute exacerbation of chronic obstructive pulmonary disease (AECOPD). The utility of spirometry performed in hospitalized patients to identify airflow obstruction, and thus a diagnosis of COPD, is unclear. Our aim was to compare inpatient spirometry, performed during an AECOPD, with outpatient spirometry. Methods: A retrospective analysis of data from patients enrolled in an AECOPD care plan was performed. As part of the plan, patients underwent inpatient spirometry to establish a COPD diagnosis and outpatient clinic spirometry within 4 weeks of hospital discharge to confirm it. Data analyzed included forced expiratory volume in 1 second (FEV1), forced vital capacity (FVC), slow vital capacity (SVC) and FEV1/ vital capacity (VC). Obstruction was defined by FEV1/VC<0.70. Results: A total of 159 patients (mean age 63.2 +/- 10.5 years) had corresponding in- and outpatient spirometry. The median days between inpatient and outpatient spirometry was 12 (interquartile range [IQR] 9-16). Inpatient spirometry had a sensitivity of 94%, specificity of 24%, positive predictive value of 83% and negative predictive value of 53% for predicting outpatient obstruction. The area under curve for using inpatient spirometry was 0.82. The mean difference between inpatient and outpatient FEV1 was 0.44 +/- 0.03 liters or 17.3 +/- 1.13 % predicted (p<0.0001) for FEV1. Conclusions: Inpatient spirometry accurately predicts outpatient airflow obstruction, thus providing an opportunity to identify patients admitted with suspected AECOPD who have no prior spirometric documentation. The diagnosis of chronic obstructive pulmonary disease (COPD) is dependent upon spirometric testing. Spirometric testing is generally performed in the outpatient setting, because of concern over spurious results in hospitalized patients who are not at their baseline. The lack of confirmatory spirometric testing leads to diagnostic uncertainty in patients hospitalized for an acute exacerbation of COPD (AECOPD). Hospitalization for an AECOPD is an important medical event that carries both a significant financial burden and physical burden.1,2 The 2006 U.S. cost for hospitalization for AECOPD was $11.9 billion, with a mean cost per admission of $9545.3 Readmissions after a hospitalization for COPD are high at approximately 20%,4 and on average, cost 1.5 times more than the index admission.5 Failure to correctly identify hospitalized patients suffering from an AECOPD can lead to: treatment failure, readmission with potential for government imposed penalties,6 and/or inappropriate treatment that may cause patient harm and needless financial expenditures. To date, many studies examining interventions7 to improve inpatient COPD care are retrospective in design and dependent on International Classification of Diseases (ICD) -9 or -10 coding.8 The ICD code is applied near the end of the hospital admission or after discharge. Identifying the AECOPD patient earlier in their hospitalization provides more time for intervention which is crucial for optimal care and readmission reduction.9 However, there are significant barriers to this identification. COPD can be both under and over diagnosed. Poor utilization of spirometric confirmation for COPD is common.15,16 In the outpatient setting, under diagnosis of COPD was found in 77% of 1540 interviewed patients who were tested by spirometry for confirmation. A “clinical diagnosis” of COPD was confirmed by spirometry in just 30% of these individuals.17 Thus, the clinical diagnosis of COPD in the outpatient setting was incorrect 70% of the time. Inpatient diagnostic confusion regarding COPD may be more common than in outpatients. Hospitalization for an acute exacerbation may be the first manifestation of COPD that leads to a clinical diagnosis. Inpatient spirometry is not currently recommended for assessing severity of COPD. Clearly, in this setting patients are not at their baseline because of muscle weakness, air trapping and bronchospasm that result from an exacerbation. Spirometry performed in the outpatient setting is clearly superior to inpatient testing. However, spirometric documentation of airflow obstruction performed during a hospitalization for AECOPD could better allocate inpatient resources. The utility of inpatient bedside spirometry to establish a diagnosis of COPD is unknown. This study tests the hypothesis that spirometry performed in the inpatient setting, while lacking sensitivity to judge severity, can be valuable in documenting the presence of airflow obstruction. Identification of a sensitive inpatient test that can delineate an AECOPD from other causes of shortness of breath has the potential to focus care, avoid unnecessary medications and prevent readmissions. We undertook a retrospective chart review of patients hospitalized and enrolled in a hospital-wide AECOPD care plan. We selected charts from patients admitted to and placed on the care plan at Wake Forest Baptist Medical Center, Winston-Salem, North Carolina over 2 time periods: August 1, 2014 through April 30, 2015 and November 29, 2015 through December 31, 2016. This study was conducted in accordance with the amended Declaration of Helsinki. The Wake Forest School of Medicine Institutional Review Board approved the protocol (IRB00033739) under expedited review. Exclusion criteria for the care plan were other causes for respiratory symptoms such as pulmonary embolism, congestive heart failure, interstitial lung disease exacerbation, pneumonia and pneumothorax. As part of the care plan, bedside spirometry was performed. Outpatient spirometry was performed within 4 weeks of hospital discharge using a Medgraphics spirometer (Medgraphics Cardiorespiratory Diagnostics, Elite DX, Medical Graphics Corporation, St. Paul, Minnesota) according to American Thoracic Society/European Respiratory Society standards.20 Acceptable vital capacity maneuvers lasted 6 or more seconds and at least 2 replicate maneuvers were required. Replicate was defined by the difference between the 2 highest forced expired volumes in the first second (FEV1) and forced vital capacity (FVC) values were both <150ml (or <100ml if FVC < 1L). The data distribution was assessed for normality using the Shapiro-Wilk test. Where normal distribution was present, means and standard deviation were expressed. This occurred for age. Where data did not follow a normal distribution, medians and interquartile ranges were used. For association between inpatient and outpatient FEV1 and FEV1/VC ratios, Pearson’s correlation was used while paired sample t tests were used to compare the difference in means, with 95% confidence intervals expressed. For comparison between the means of variables with a normal distribution (age) in the obstructed, restricted or normal spirometry groups, Student’s t-test was used. The Wilcoxon test was used to compare the medians of non-parametric variables (BMI, days between admission and spirometry, and days from inpatient to outpatient spirometry). 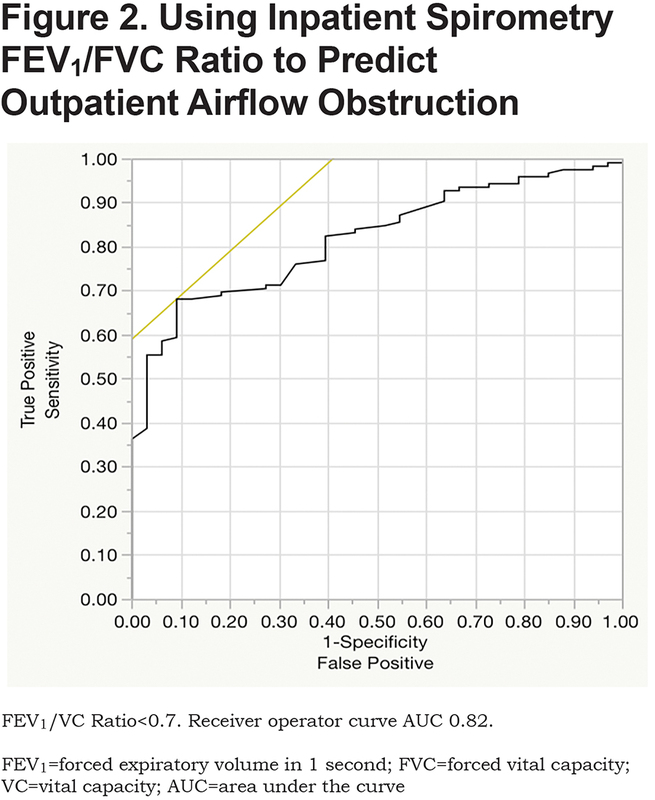 Receiver operator curve curves were used to assess accuracy of inpatient spirometry to predict outpatient airflow obstruction. We used a p value < 0.05 for statistical significance. JMP Pro 11.2.0 (SAS, Cary, North Carolina) was used for statistical analysis. Corresponding in- and outpatient spirometry was available on 159 patients. 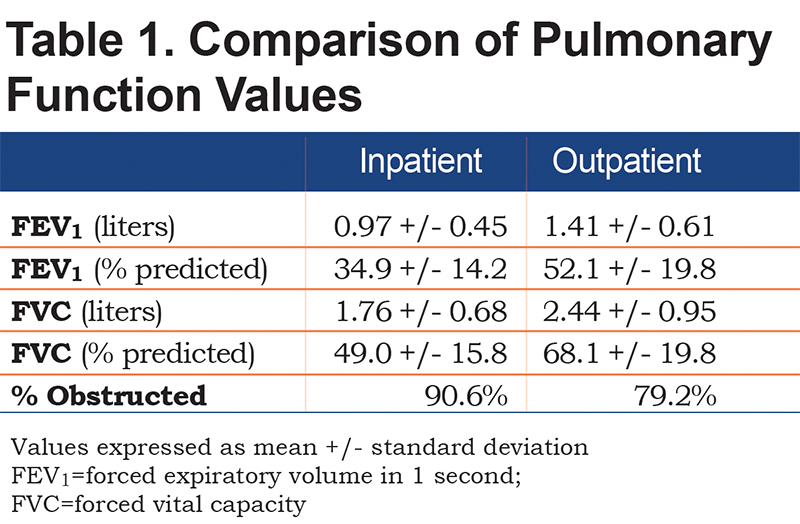 Comparison between inpatient and outpatient spirometry values are shown in Table 1. Using the above inclusion criteria for our COPD pathway, 126/159 patients (79.2%) were found to have obstruction on outpatient testing consistent with COPD. A total of 24/159 (15.1%) were found to have restrictive spirometry that would require further lung volume testing, while 9/159 (5.7%) had normal spirometry. The patients in the restricted group had significantly higher median BMI compared to the obstructed (p<0.0001) and normal groups (p=0.012). The obstructed spirometry group had a greater proportion of males compared to the restricted and normal spirometry groups. Those with obstructed spirometry were significantly older than the restricted group (mean difference 4.7 +/- 2.0, p=0.019), but this did not reach significance compared to the normal group (mean difference 6.6 +/- 3.4, p=0.054) Among the obstructed, restricted and normal spirometry groups, there were no significant differences in days between admission to inpatient spirometry, and days between inpatient and outpatient spirometry (Table 2). Inpatient spirometry was performed 2 days (median, IQR 1-3) from admission. The median number of days between inpatient and outpatient spirometry was 12 (IQR 9-16). Spirometry values for both inpatient and outpatient are shown (Table 1). The majority of patients (40.9%) were in GOLD stage 2 (FEV1 50%-80%), 49.1% had severe (GOLD 3, 38.4%) or very severe (GOLD 4, 10.7%) airflow obstruction. Table 3 provides a comparison of inpatient versus outpatient spirometry patterns. None of the inpatient spirometry performed in this cohort were normal (FEV1 and FVC both more than 80% predicted). Of the abnormal inpatient spirometric tests, 5.7% (9/159) were normal on outpatient spirometric testing. 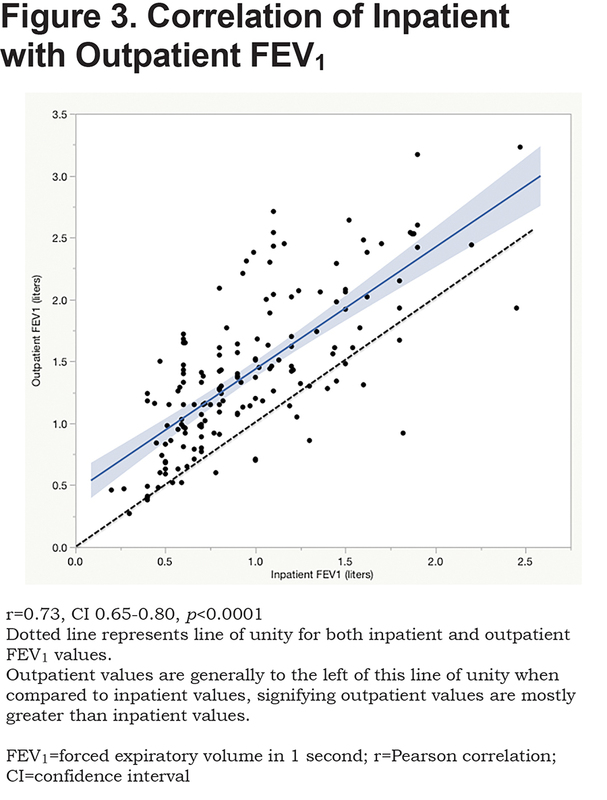 Inpatient FEV1/FVC ratios correlated well with outpatient ratios (r=0.69, confidence interval (CI) 0.60-0.77, p<0.0001; Figure 1). The area under curve for predicting outpatient obstruction using inpatient spirometry was 0.82 (Figure 2). The sensitivity and positive predictive value using inpatient spirometry to predict outpatient airflow obstruction was high at 94.4% (119/126) and 82.6% (119/144) respectively. Negative predictive value and specificity are 53.3% (8/15) and 24.2% (8/33) respectively. 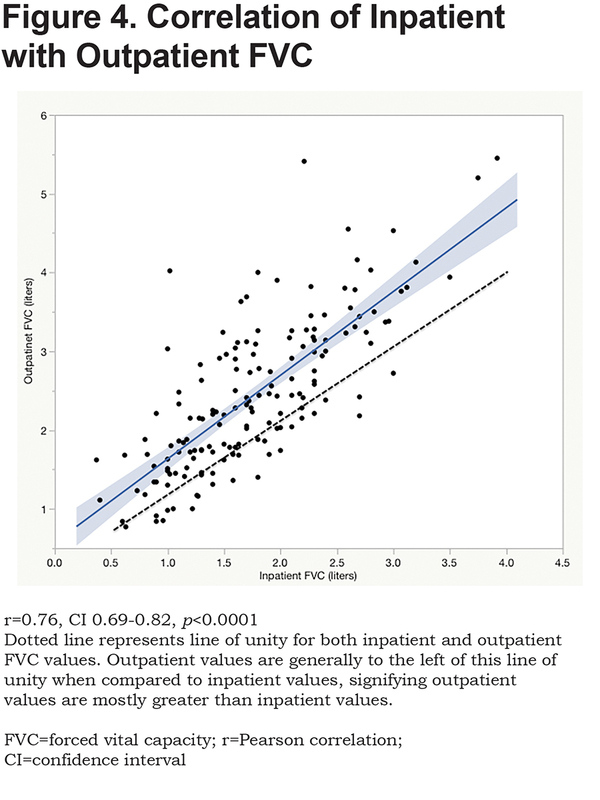 There is a moderate linear correlation between inpatient and outpatient FEV1 (r=0.73, CI 0.65-0.80, p<0.0001) (Figure 3). A paired sample t test found that the mean difference between inpatient and outpatient FEV1 was 0.44 +/- 0.03 liters or 17.3 +/- 1.13 % predicted (p<0.0001) for FEV1. There was also moderate correlation between inpatient and outpatient FVC (r=0.76, CI 0.69-0.82, p<0.0001) (Figure 4). The mean difference between inpatient and outpatient FVC was 0.68 +/- 0.05 liters (p<0.0001), 19.1 +/- 1.3 % predicted for FVC. There was no significant linear correlation between the difference noted between in- and outpatient spirometry and the days that elapsed between the 2 test dates for FEV1 (r=0.10, CI -0.057-0.25, p=0.21) or FVC (r=0.04, CI -0.12-0.20, p=0.61). Thus, the number of days between inpatient and outpatient spirometry did not affect the difference between in- and outpatient FEV1 values. 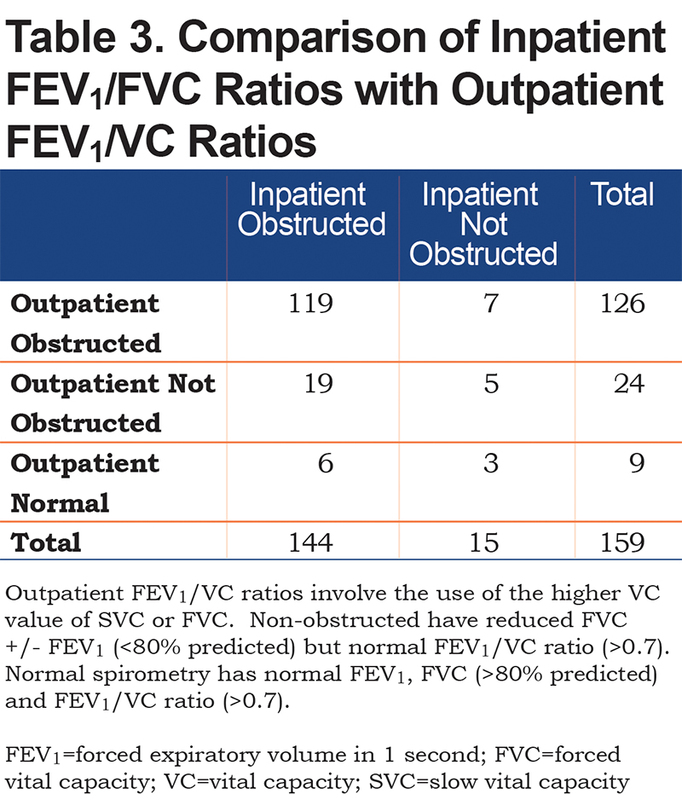 Inpatient spirometry can overestimate severity of airflow obstruction. Of the 114 patients with airflow obstruction, 102 had inpatient FEV1<50% on inpatient spirometry, however 36 of them (35.3%) did not have FEV1<50% on outpatient testing. We found that inpatient spirometry performed during hospitalization for AECOPD had good accuracy to predict outpatient airflow obstruction for patients with risk factors for COPD (age, smoking) and admitted for probable AECOPD without prior spirometry. Inpatient spirometry picked up 94.4% (119/126) of patients found to have obstruction on outpatient spirometry. Of patients who had airflow obstruction on inpatient testing, 82.6% (119/144) also showed obstruction on outpatient spirometry. However, 7 out of 15 patients (46.7%) who initially had a restricted pattern on inpatient spirometry converted to an obstructed pattern on outpatient spirometry. This misclassification of true obstruction as restriction only represented 4.4% (7/159) of the total cohort. Poor effort, weakness and early airway closure associated with an AECOPD could lead to air trapping and therefore, a restricted pattern. Complete pulmonary function tests with pre/post bronchodilator assessment and lung volume testing, which is not usually feasible on an inpatient basis, are required to identify these patients. Failure to confirm inpatient testing when outpatient stability is achieved fosters misclassification of this group of patients, and it is vital that an accurate diagnosis and treatment plan is made, in a timely manner. Patients found to have restrictive inpatient spirometry should not be dismissed as not having COPD. 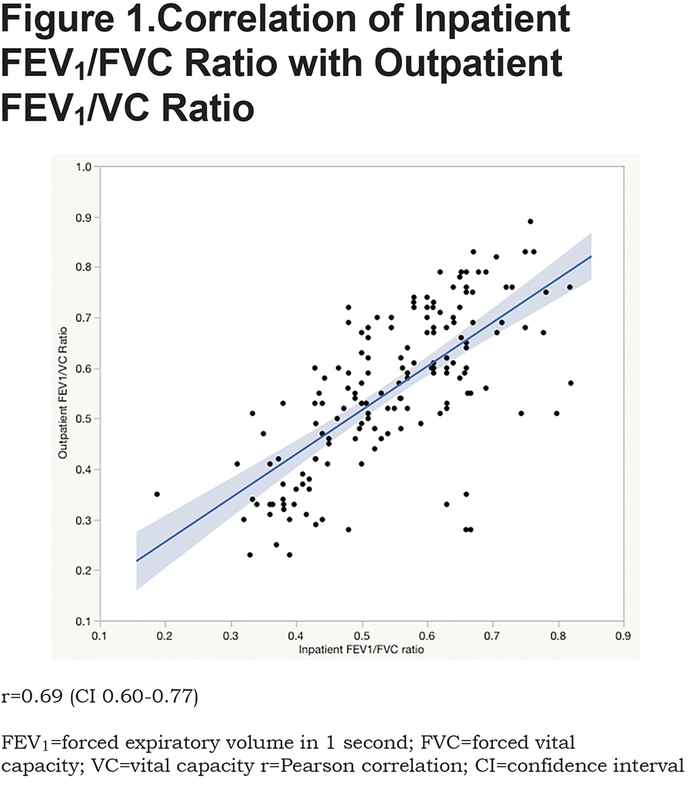 Inpatient spirometry correlated moderately with outpatient severity (r=0.73) but the mean difference in FEV1 was large (0.44 liters or 17.3 % predicted). Thus, 35% of patients with mild and moderate obstruction were misclassified as having severe airflow obstruction based on inpatient spirometry. Although there are concerns about the quality of spirometry obtained during an admission for AECOPD, Prieto Centurion et al evaluated the quality of spirometry obtained from patients admitted for an acute exacerbation of asthma or COPD.22 They found that 73% of 113 of spirometry tests had 3 acceptable efforts. The vast majority of hospitalized patients were able to perform adequate spirometry tracings. In this study, only acceptable FVC maneuvers were evaluated. Rea et al found that there was no significant change at 4 days (median) between inpatient and outpatient spirometry performed 1 month later, and no patient moved more than one GOLD- COPD severity grade up or down over this interval.23 White et al found that measurements were stable between day 5 and day 28 after an AECOPD.9 In children and adolescents with cystic fibrosis, Sanders et al found that an exacerbation does not contribute significantly to within day spirometry variation, and there was no significant difference in coefficient of variation for FVC and FEV1 at admission, 3 days of discharge and follow up.24 In our study, we found that the majority of our inpatients (52%) had GOLD stage 2 (FEV1 50%-80%), while 43% had severe or very severe airflow obstruction. Similarly, Mapel et al found in their cohort that 50% of outpatients with newly diagnosed COPD had GOLD stage 2, 31% with GOLD stage 3 or 4, and they also found that the majority were not receiving maintenance treatment.25 It is vital that efforts are taken to identify these patients prior to discharge so they receive optimal management for COPD. Inpatient spirometry can confirm a diagnosis of COPD with good accuracy in patients with a high pretest probability, but over estimates severity. These findings are similar to the above study by Rea et al. Spirometry performed earlier in a hospital admission (2 days median) rather than at discharge facilitates a timely diagnosis to provide multidisciplinary care under a focused COPD pathway during an inpatient stay and more prompt and therefore, more complete discharge planning. Limitations of our study include the relatively small number of patients as well as the retrospective nature of our study. While we recruited patients from our COPD pathway, those who had preexisting spirometry did not need to have inpatient spirometry, so these patients were not part of this study. We also only included spirometry within 1 month of hospital admission for more reliable comparison. Hence, we were unable to have corresponding spirometry to compare in- and outpatient for many patients. We also did not assess lung volumes and so restriction could not be confirmed where spirometry demonstrated a restricted pattern. There was variability as to when inpatient spirometry was performed relative to admission and discharge and also when outpatient spirometry was performed relative to discharge date. Because the focus of this study was the predictability of the pattern of spirometric abnormality rather than severity, time constant variability was not expected to be problematic. Patients in the obstructed group did not have a significantly different number of days between spirometry compared to restricted or normal spirometry groups. As expected, evaluation of the effect of these variables showed little effect on outcome. Despite these limitations, we derive conclusions similar to others, which support the use of inpatient spirometry to confirm airflow obstruction in the acute exacerbation setting, when the diagnosis of COPD is presumed but not previously documented. We recommend the use of inpatient spirometry to identify airflow obstruction in new patients presumed to have AECOPD. Inpatient spirometry has good accuracy in identifying airflow obstruction and has been shown to facilitate early detection of COPD. Confirmation of an AECOPD diagnosis early during the hospitalization allows immediate resource utilization and early multidisciplinary interventions, crucially augmenting the armamentarium that may reduce COPD readmissions. Chee Hong Loh has personally reviewed the efficacy data, understands the statistical methods employed for efficacy analysis, and confirms an understanding of this analysis, that the methods are clearly described and that they are a fair way to report the results. Dr. Loh had full access to all of the data in the study and takes responsibility for the integrity of the data and the accuracy of the data analysis, including and especially, any adverse effects. Chee Hong Loh, Frank A. Genese, Kavya K Kannan, Tina M. Lovings, Stephen P. Peters, and Jill A. Ohar contributed substantially to the study design, data analysis and interpretation, and the writing of the manuscript. Chee Hong Loh, Frank Genese, Tina Lovings and Kavya K. Kannan have no disclosures. Stephen P. Peters has served as a consultant for Array Biopharma, AstraZeneca, Aerocrine, Airsonett AB, Boehringer-Ingelheim, Experts in Asthma, Gilead, GlaxoSmithKline, Merck, Novartis, Ono Pharmaceuticals, Pfizer, PPD Development, Quintiles, Sunovion, Saatchi & Saatichi, Sanofi Regeneron, Targacept, TEVA, and Theron. However, no financial support was received from these organizations for this study. Jill A. Ohar has served as a consultant to AstraZeneca, Novartis, Sunovion, Boehringer-Ingelheim, Mylan, Theravance, and CSL Behring and receives compensation for these services. However, no financial support was received from these organizations for this study. 5. Elixhauser A, Au DH, Podulka J. Healthcare Cost and Utilization Project Statistical Brief #121: Readmissions for chronic obstructive pulmonary disease, 2008. Agency for Healthcare Research and Quality website. https://www.hcup-us.ahrq.gov/reports/statbriefs/sb121.pdf Published 2011. Accessed July 2017. 6. Centers for Medicare and Medicaid Services (CMS). Readmissions reduction program. CMS website. https://www.cms.gov/medicare/medicare-fee-for-service-payment/acuteinpatientpps/readmissions-reduction-program.html. Published 2017. Accessed July 16, 2017. 8. World Health Organization (WHO). ICD-10 Version: 2016.WHO website. http://apps.who.int/classifications/icd10/browse/2016/enx Published: 2016. Accessed July 16, 2017. 13. Global Initiative for Chronic Obstructive Lung Disease (GOLD). Global strategy for the diagnosis, management and prevention of COPD, 2017. GOLD website. http://goldcopd.org/gold-2017-global-strategy-diagnosis-management-prevention-copd/. Published 2017. Accessed July 16, 2017.